Has this happened to you? You visit a friend’s house and as soon as you walk in, all you can smell is one unpleasant smell, VERY strongly? It might be kitty litter, leftover dinner smell or cigarettes. You might think, “Eww, how can they stand their house smelling this way?” However the reality is, they don’t notice it. They are noseblind. Just as you are noseblind to the smells in your own house. Example: I can’t attend Book Club this week. Nancy is completely noseblind to the fact that her house smells like a feral cat shelter. According to a recent Febreze survey, 42% of Canadians admit that they’ve been told that their homes smell, but they can’t smell it themselves. 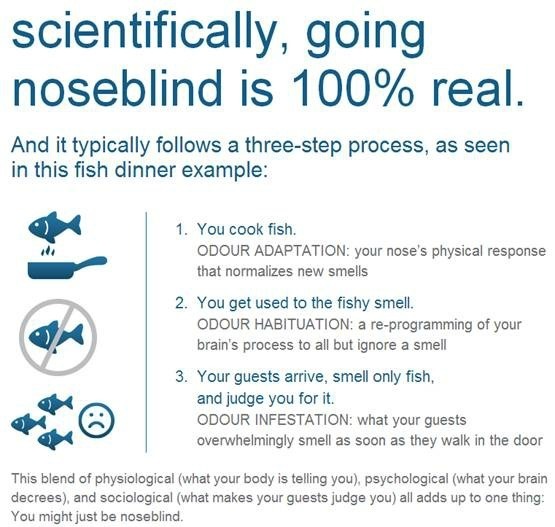 Noseblind is what happens when your brain gets used to a smell. Is The Smell of Our Homes That Important? 93% of Canadians would like to know if their homes smelled bad. Wouldn’t you?! 48% of Canadians believe that a smelly home is the sign of a dirty, lazy homeowner. Ouch!! Back on the dating scene or have a teen who’s trying to impress? For 61% of Canadians, the smell of their date’s home is a deal breaker, and 28% would make a quick exit if their date’s home smelled. Excuses, excuses: 36% of Canadians have either avoided visiting friends with smelly abodes or make it a quick stop. Doorbell or warning bell? 37% of Canadians panic when unexpected guests drop by. Is your home always ready for guests? 45% of us dread visiting homes with pets because of the smell. Don’t let Fido take the blame, take action! 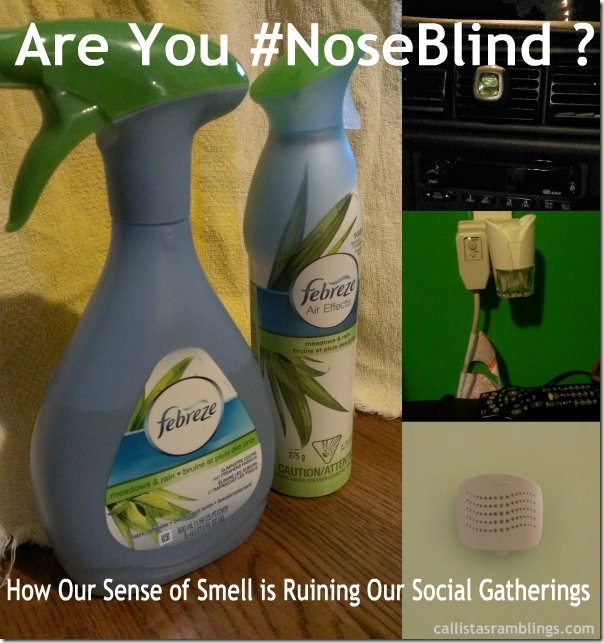 Use Febreze products to help eliminate the smells in your home that you are noseblind to so you don’t have to worry about what your guests think. There are different products for different home areas and uses so pick a few that works for your house in whatever scent you like and you can rest easy. Use NOTICEables oil warmers to keep a lingering scent in a room with an accessible plug. Perfect for those strong smelling areas. The Set and Refresh is great for a bedroom as it can just sit on an end table and doesn’t need a plug or anything to work. Use the Car Vent clip to keep your car smelling fresh. The Stick and Refresh works well above your garbage in your kitchen. Febreze would like to offer one Canadian winner a Febreze prize pack worth approximately $50 so you can ensure your home smells nice.